There are 60 Assisted Living Facilities in the Westminster area, with 6 in Westminster and 54 nearby. The average cost of assisted living in Westminster is $4,325 per month. This is higher than the national median of $3,346. Cheaper nearby regions include Arvada with an average starting cost of $3,940. To help you with your search, browse the 228 reviews below for assisted living facilities in Westminster. On average, consumers rate assisted living in Westminster 4.4 out of 5 stars. Better rated regions include Golden with an average rating of 4.8 out of 5 stars. Caring.com has helped 8 families in Westminster find high-quality senior care. To speak with one of our Family Advisors about assisted living options and costs in Westminster, call (855) 863-8283. Westminster, Colorado, has a population of about 113,000, 11 percent of whom are seniors 65 and over. Seniors who need some help with activites of daily living and wish to live in the Westminster area have over five dozen to choose from. 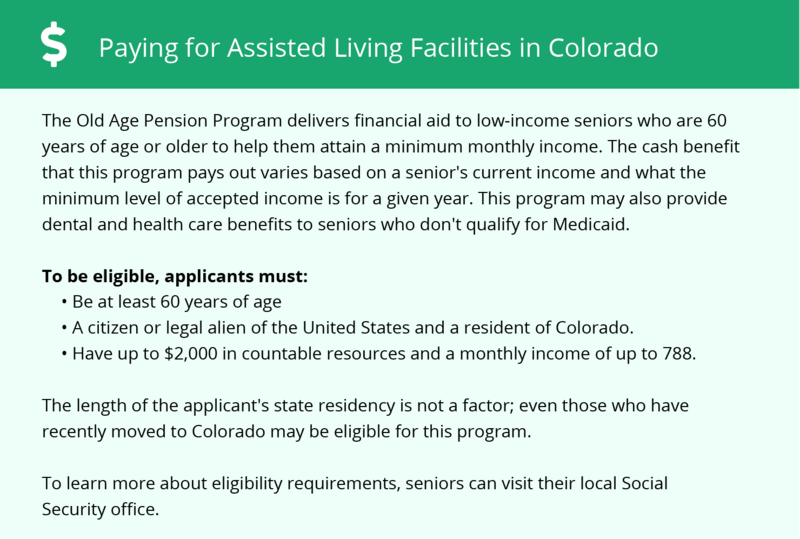 Assisted Living Facilities (ALFs) in Colorado are administered by the Colorado Department of Public Health and Environment. Facilities that are certified to receive Medicaid reimbursements are referred to as Alternative Care Facilities (ACFs) and must meet additional requirements. Westminster averages 242 sunny days each year, however, winter brings around 53 inches of snow. In summer, the average high is 89 degrees, and the January low is 18. Colorado has a large deduction on all retirement income, so seniors will only pay income tax if their annual income reaches a certain level. In addition, while sales tax in the state is high, groceries and medicine are exempt, leaving more money available for your retirement budget. Public Transportation in Westminster is provided by RTD-Denver. Seniors aged over 65 receive a 50 percent discount on fares. In addition, seniors in Westminster have access to transportation services, administered by the Senior Resource Center. Westminster has an array of community resources for seniors, including The Senior Hub, an organization that advocates and offers programs for seniors as well as more than three senior centers. The cost of living in Westminster is 12 percent higher than the national average. Health care and transport costs are around 5 percent higher than averages across the United States, however, groceries are slightly less expensive than the national average. Westminster has a higher than average crime rate in both violent and property crime. The rate of violent crime is 2.36 per 1000 residents, slightly less than the Colorado average of 3.43. However, property crime occurs at a rate of 35.16 per 1000 residents, compared to the Colorado average of 27.41, so seniors should watch out for their belongings when out and about on day trips. Assisted Living costs in Westminster start around $4,325 per month on average, while the nationwide average cost of assisted living is $4,000 per month, according to the latest figures from Genworth’s Cost of Care Survey. 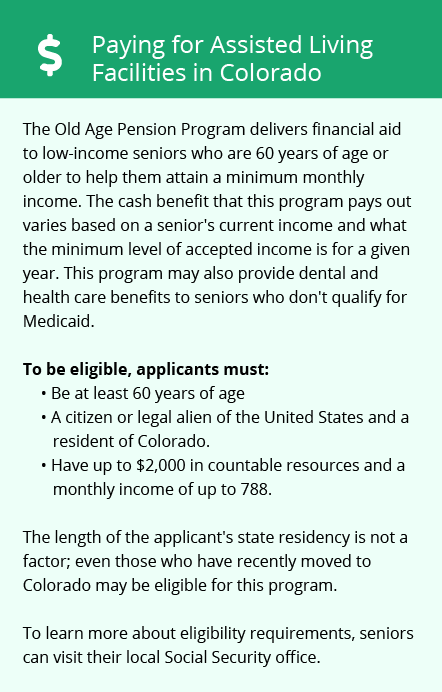 Seniors in Colorado may be eligible for the Home and Community-Based Services Waiver for persons who are Elderly, Blind, or Disabled (EBD). This can help fund residents in alternative care facilities. To see a list of free assisted living resources in Westminster, please visit our Assisted Living in Colorado page. Westminster-area assisted living communities must adhere to the comprehensive set of state laws and regulations that all assisted living communities in Colorado are required to follow. Visit our Assisted Living in Colorado page for more information about these laws.